Properly caring for your business and special occasion garments will keep you well-suited for many years to come. Use these tips as a guide for extending their life and looking your very best when it matters most. Cleaning: You don’t always need to dry clean suits after each wear since they don’t come in direct contact with your skin. Between trips to the dry cleaner, use a suit brush to remove loose dirt and lint. As soon as possible, spot clean minor spills using water and a soft towel to prevent stains from setting in. Be sure to let any wet spots dry by hanging in a well-ventilated area, away from sunlight, before putting it back in the closet. If your suit doesn’t pass the sniff test or has a stubborn stain, professional cleaning is a must. For most people, that means after four or five wears for business suits, and after each wear for formal suits and dresses. If your dress pants or skirts are made of a stain-repellent material, you can also wear them a few times before you need to bring them to the cleaner. 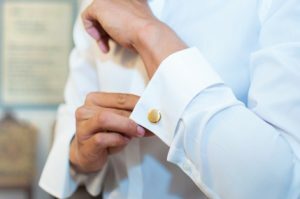 Since dress shirts and silk blouses fit close against your skin and absorb your sweat, they require more regular cleaning. Wearing an undershirt to absorb sweat, as well as avoiding the use of starch, can extend their wear life. In general, and depending on season and temperature, dress shirts should be cleaned after three or four wears, unless the shirt is white. In that case, washing after each wear is recommended. Silk blouses should also be professionally cleaned after each wear. Hanging: Be sure to air out your jackets, pants, skirts and dresses by hanging them in a well-ventilated closet after you’ve worn them. To maintain the shape of your suit jacket, use wood or plastic hangers with rounded edges which will fill out the shoulders and allow it to naturally go back to its original drape within a day or two. Remember to avoid overstuffing your closet with too many hanging items – your wardrobe pieces need air flow and room to breathe. Pressing: To keep your suit in top condition, invest in a home steamer for touch-ups between dry cleaning. You can also hang it in the bathroom and use post-shower steam to help smooth out remaining wrinkles. Avoid using a dry iron on jackets, pants, skirts, or formal dresses as it can burn the fibers and add a sheen to the material. Off-Season Storing: Not all suits are can be worn throughout the year. Before you put away your heavy wool for summer or your seersucker for winter, you should have it dry cleaned to remove any food particles or stains. If left unchecked, they create a feeding ground for moths and other fabric-damaging insects. 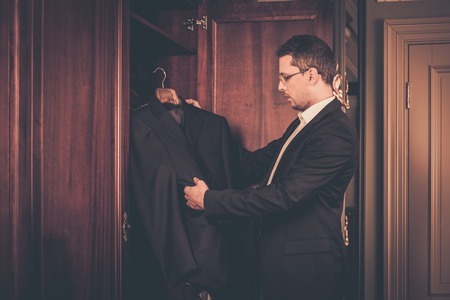 Once cleaned, store your suits and formal attire upright in a garment bag in your closet. Make sure all items are completely dry before storing to avoid mildew or mold that grows on wet or damp fabrics.